And for that pleasurable bit of work and chat, you are rewarded with a tender and ethereally light corn dumpling filled with smoky, spicy beans. Truly, these are something that you need to be careful that you don’t finish off the batch prior to transporting them to the table. They are that good. Top them with a bit of chili made with lamb and you have a fabulous Mexican meal, albeit given a bit of a twist. Which is something we really like around this cocina. In a large pan, render the bacon until almost crisp. Add the onions and soften over medium heat for for three to four minutes. Add the pureed beans and cook until concentrated (i.e., when pinched, easily hold together), approximately 20 minutes, depending on how much liquid was added to puree. Set aside. In the bowl of a stand mixer, add the lard, salt and baking powder. Mix on medium while you reconstitute the masa harina with the hot water in a separate bowl. Knead the masa and the water together to incorporate well. Then add, in three batches, the masa to the well-mixed lard. Reduce the speed to medium-low and add a cup of the stock. Mix well. Turn off mixer, scoop a 1/2 teaspoon of the masa, and drop in a glass of cold water. If it floats, it is sufficiently mixed. Add the last 1/2 cup of stock to the masa and mix for another minute until it resembles silky, but not runny, cake batter. Taste for seasoning (it’s already awesome). Drain the corn husks. Take one of the longest and shred it into strands (tearing from top to bottom) for tying the tamales. Set up an assembly line with the husks, masa, beans and ties. Spread a 4 by 4 square of masa on a corn husk, leaving at least 3/4 of an inch at the wider top of the husk and an inch (or more) at the narrower bottom. Take a pinch of the refritos and center it in a line down the middle of the masa, leaving a bit of space at the top and bottom. Fold the two sides of the husk together, so the the edges of the masa meet. Then, fold the sides of the husk together around the tamale so the masa and beans are completely enclosed. Fold up the bottom of the tamale to the bottom of the masa. 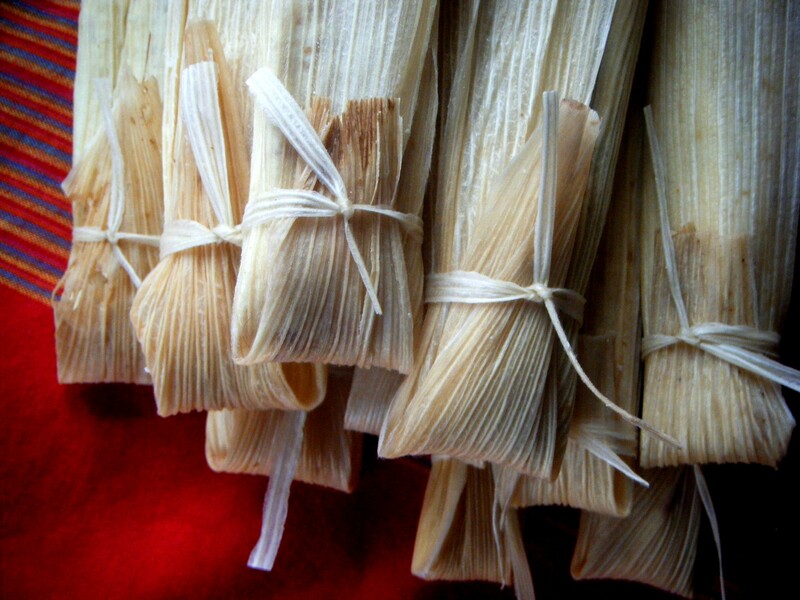 Take a strip of the corn husk and tie it around the tamale, not too tightly, as the tamales expand as they steam. Repeat for the rest. In a spaghetti pot with an insert (which works ideally), stand up all the tamales on their bottoms (i.e., the folded ends). Put on the lid and bring to a boil. Steam for 1 hour and 15 minutes. Check water level at least twice during cooking. Add additional boiling water if pot gets too low. 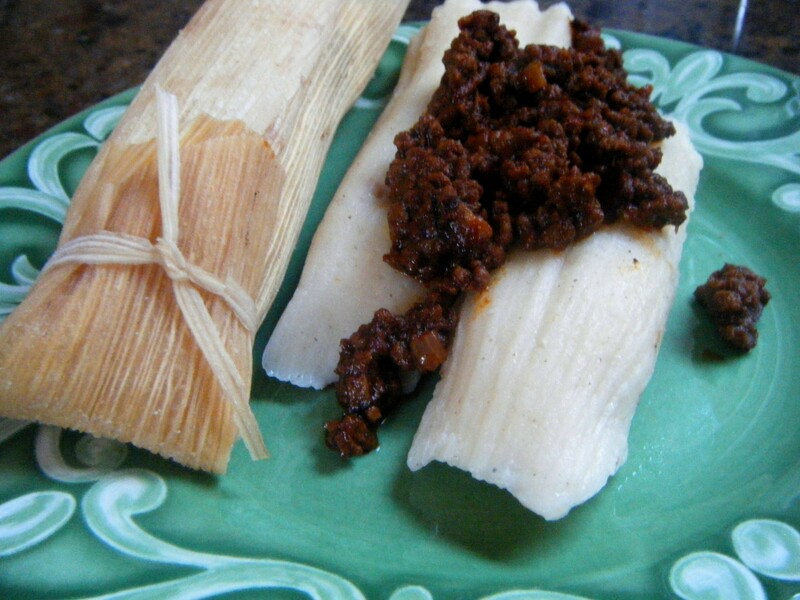 Allow tamales to sit and cool for a few minutes before serving, if you can stand it. Top with avocado crema, lamb chili or poblano brown butter. Goodness, there are two recipes Persephone still owes you. Remind me, I’ll get them done. Playlist included Everybody Hurts by R.E.M. because it was filmed under a freeway being built in San Antonio all those years ago. And it’s awesome. I’m definitely gonna have to give this one a try. Now that it’s getting warmer I start doing Latino dishes much more. Remind me next time you come to the spice shop to give you my carne asada recipe along with my homemade refried bean recipe and the achiote chicken. Between the two of us we could make a Latin smorgasbord. That sounds great, Ben! And I want that recipe! I think if I have a fiesta this summer in the backyard, you’re totally invited! The homemade goodness, so great the tamales barely make it from oven to table, is exactly the same. Isn’t it amazing how a single dish can have so many variations? Aren’t they sooo tasty? I was amazed. I’ve eaten so many tamales in my life, I was caught off guard with how light these were. As for the pain in the arse part, you’re probably right if you’re making a huge batch of them, but this honestly didn’t take too long to assemble. I guess I grew up with Grandmas in San Antonio complaining. And also! I had wondered about steaming them in the oven, because in San Antonio, they are never tied. But since I was putting them in the steamer (a la Rick Bayless suggested) I stood them up. I’ll use your method next time and make sure you get a batch for Christmas!